The Souls of W. E. B. 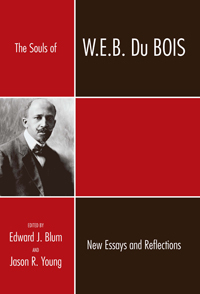 Du Bois is a collection of articles that treat Du Bois on the subject of religion by reintroducing his life and work to an audience that may be familiar with his work generally but may never have seen analyses of his study of religion. Because the project includes articles that examine both Du Bois’s personal religious life along with his examination of religion, the editors seek to add not only to our knowledge of Du Bois’s scholarly contributions but also hope to shed light on his personal life and religiosity. Also, in treating the biography and career of a thinker whose work covers much of the twentieth century, the editors intend this work to address larger issues related to religion in the United States over the course of the century. Just as Du Bois’s foresight predicted a century marred by racial violence, so his varied explorations into the role of religion in the modern world anticipated the rise of contemporary tensions borne of the global circulation of corporate capital and commerce, of religious fundamentalism and evangelical theology. Indeed, Du Bois identified the critical paradox and presumed contradiction between America’s religious legacy built on morality, justice, and equality with the country’s impending devotion to progress, modernity, and money. Throughout his life and writing, Du Bois explored the special tensions that erupted in a nation bowing before two gods. Unfortunately, scholarly treatment of both Du Bois’s critical writings on religion, as well as his own personal religious development, has been relatively lacking. The soulful side of the man whose most famous work was about the souls of black folk, in short, has been largely neglected.